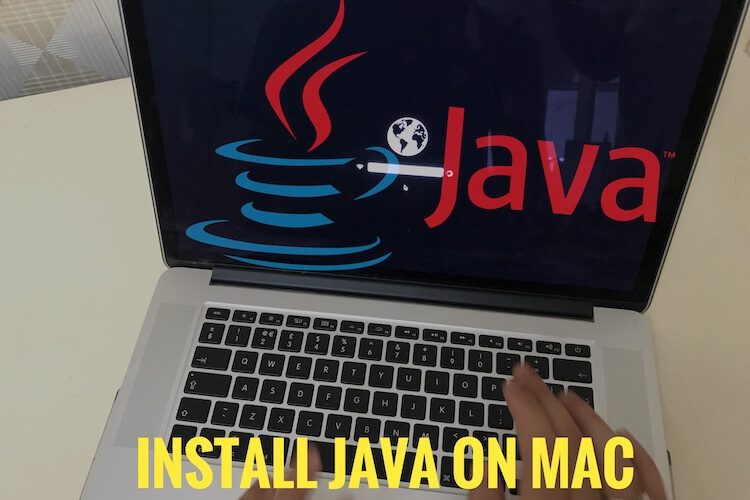 Your identity in signature at the End of mail that you send from Mail app on Mac or iPhone is Very useful for all professional and Business purpose. Here you have to learn how we can make our signature more delightful and informative. Yes, you can add emoji, Images (Business logo, Picture), Plain Text, Web address, HTML, Digital Signature or name in your Signature. Also able to set different signature in different mail account, Switch to another mail account also gets new signature and more. Learn how to add Email Signature with image in macOS Sierra. Note: Existing Signature created on iPhone doesn’t make any effect after create signature on Mac for the same account. 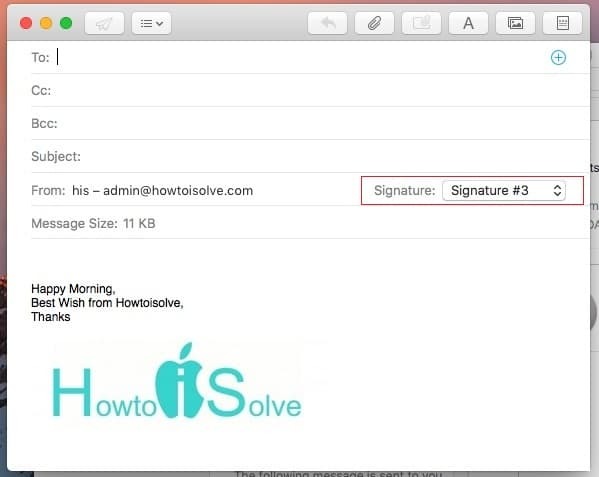 Signature on Mail app for different devices, Save it locally and use when you compose new mail. 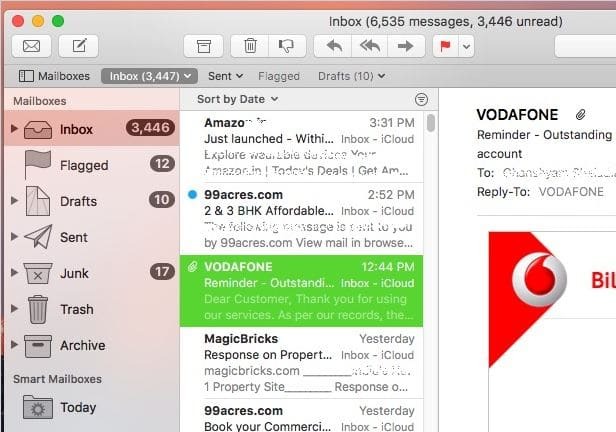 1: Launch Mail app on Mac. 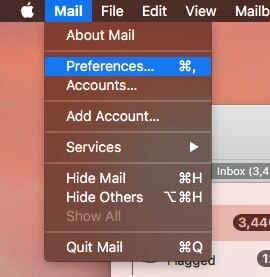 2: From Top Mac menu, Under Mail > Click on Preference. 3: Next, Option windows click on Signature option from top tab. 4: First Pan Showing all added account in your Mail app, Choose account where you want create signature for that. Here I made signature for my iCloud mail account. 5: Next, Click on “+” icon and gives name of the signature. Note: Under single mail account you can add any numbers of different signature with this “+” option. 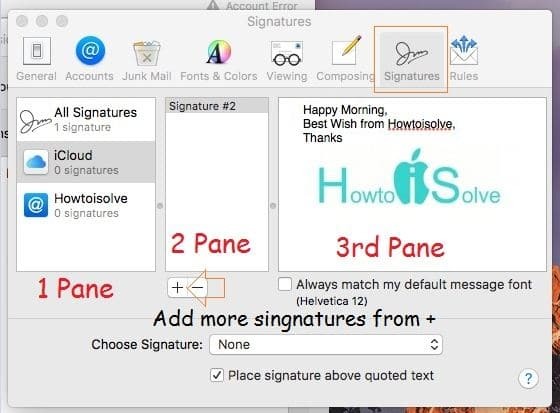 Last pane is for make signature, type here it will auto save and will be found when you compose new mail from mail app. 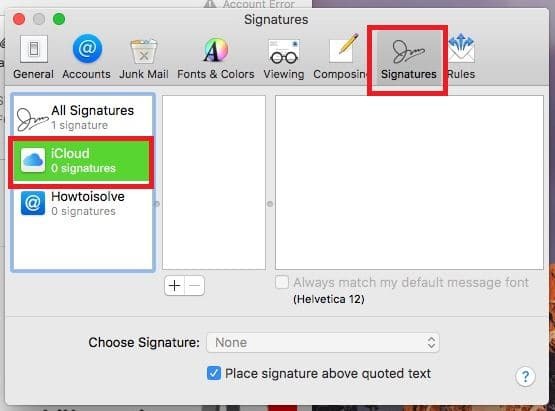 Now easy to use when you compose mail or Change signatures you created for the mail account, See Below image. Future time you can re-Edit, Remove or Add more signature easils that’s you show in above steps. Also for other Mac OS Yosemite, EI Capitan you can do like macOS Sierra. 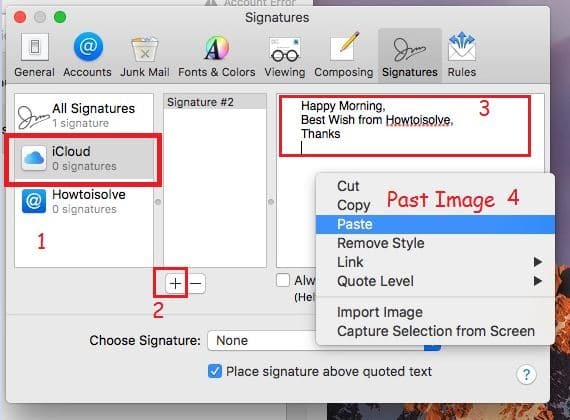 Want more help on Add Email Signature with image in macOS Sierra on Mac, MacBook, iMac. Share related with us, we are here. The only way I can get my signature to appear in multiple colors with my logo is by unchecking “always match default message font”. Now it shows in basic block letters. It worked perfectly until I had to re install my mail program. I am using 11.02 Safari and gmail..